Madeira ( , ; [mɐˈðejɾɐ, -ˈðɐj-]) is a Portuguese archipelago situated in the north Atlantic Ocean, southwest of Portugal. Its total population was estimated in 2011 at 267,785. The capital of Madeira is Funchal, located on the main island's south coast. The archipelago is just under 400 kilometres (250 mi) north of Tenerife, Canary Islands. Since 1976, the archipelago has been one of the two autonomous regions of Portugal (the other being the Azores, located to the northwest). It includes the islands of Madeira, Porto Santo, and the Desertas, administered together with the separate archipelago of the Savage Islands. The region has political and administrative autonomy through the Administrative Political Statue of the Autonomous Region of Madeira provided for in the Portuguese Constitution. The autonomous region is an integral part of the European Union, having pronounced status as an outermost region of the European Union, as detailed in Article 299-2 of the Treaty of the European Union. Today, it is a popular year-round resort, being visited every year by about one million tourists, three times its population. The region is noted for its Madeira wine, gastronomy, historical and cultural value, flora and fauna, landscapes (Laurel forest) which are classified as a UNESCO World Heritage Site, and embroidery artisans. Its annual New Year celebrations feature the largest fireworks show in the world, as officially recognised by Guinness World Records in 2006. The main harbour in Funchal is the leading Portuguese port in cruise liner dockings, being an important stopover for commercial and trans-Atlantic passenger cruises between Europe, the Caribbean and North Africa. Madeira is the second richest region of Portugal by GDP per capita, only surpassed by Lisbon. Plutarch (Sertorius, 75 CE) referring to the military commander Quintus Sertorius (d. 72 BC), relates that after his return to Cádiz: "The islands are said to be two in number separated by a very narrow strait and lie 10,000 furlongs (2,011.68 km) from Africa. They are called the Isles of the Blessed...". Archeological evidence suggests that the islands may have been visited by the Vikings sometime between 900-1030. During the reign of King Edward III of England, lovers Robert Machim and Anna d'Arfet were said to flee from England to France in 1346. They were driven off their course by a violent storm and their ship went aground along the coast of an island that may have been Madeira. Later this legend was the basis of the naming of the city of Machico, in memory of the young lovers. 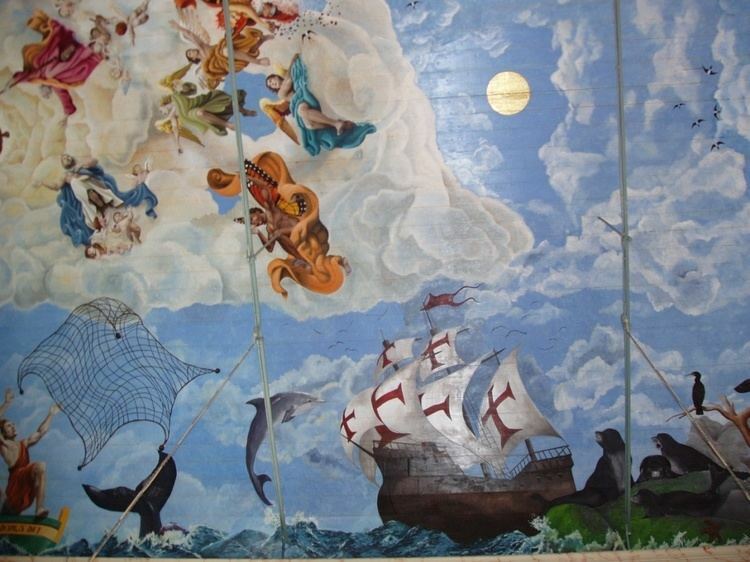 In 1418, two captains under service to Prince Henry the Navigator, João Gonçalves Zarco and Tristão Vaz Teixeira, were driven off course by a storm to an island which they named Porto Santo (English: holy harbour) in gratitude for divine deliverance from a shipwreck. The following year, an organised expedition, under the captaincy of Zarco, Vaz Teixeira, and Bartolomeu Perestrello, traveled to the island to claim it on behalf of the Portuguese Crown. Subsequently, the new settlers observed "a heavy black cloud suspended to the southwest." Their investigation revealed it to be the larger island they called Madeira. Grain production began to fall and the ensuing crisis forced Henry the Navigator to order other commercial crops to be planted so that the islands could be profitable. These specialised plants, and their associated industrial technology, created one of the major revolutions on the islands and fuelled Portuguese industry. The expansion of sugar plantations in Madeira began in 1455, using advisers from Sicily and financed by Genoese capital. (Genoa acted as an integral part of the island economy until the 17th century). The accessibility of Madeira attracted Genoese and Flemish traders, who were keen to bypass Venetian monopolies. On 12 December 1917, two German U-boats, SM U-156 and SM U-157 (captained by Max Valentiner), again bombarded Funchal. This time the attack lasted around 30 minutes. The U-boats fired 40 4.7-and-5.9-inch (120 and 150 mm) shells. There were 3 fatalities and 17 wounded; a number of houses and Santa Clara church were hit. Charles I (Karl I), the last Emperor of the Austro-Hungarian Empire, went to Madeira after the war. Determined to prevent an attempt to restore Charles to the throne, the Council of Allied Powers agreed he could go into exile on Madeira because it was isolated in the Atlantic and easily guarded. He died there on 1 April 1922 and is buried in Monte. In August 2016, wildfires spread on Madeira and reached Funchal, killing three and destroying 150 homes. The archipelago of Madeira is located 520 km (280 nmi) from the African coast and 1,000 km (540 nmi) from the European continent (approximately a one-and-a-half hour flight from the Portuguese capital of Lisbon). It is found in the extreme south of the Tore-Madeira Ridge, a bathymetric structure of great dimensions oriented along a north-northeast to south-southwest axis that extends for 1,000 kilometres (540 nmi). This submarine structure consists of long geomorphological relief that extends from the abyssal plain to 3500 metres; its highest submersed point is at a depth of about 150 metres (around latitude 36ºN). The origins of the Tore-Madeira Ridge are not clearly established, but may have resulted from a morphological buckling of the lithosphere. Porto Santo (42.5 km²), including Ilhéu de Baixo ou da Cal, Ilhéu de Ferro, Ilhéu das Cenouras, Ilhéu de Fora, Ilhéu de Cima; Total population: 5483 (2011 Census). Madeira has been classified as a Mediterranean climate (Köppen climate classification: Csa/Csb). Based on differences in sun exposure, humidity, and annual mean temperature, there are clear variations between north- and south-facing regions, as well as between some islands. The islands are strongly influenced by the Gulf Stream and Canary Current, giving mild year-round temperatures; according to the Instituto de Meteorologia (IM), the average annual temperature at Funchal weather station is 19.6 °C (67.3 °F) for the 1980–2010 period. Porto Santo has at least one weather station with a semiarid climate (BSh). On the highest windward slopes of Madeira, rainfall exceeds 1,250 mm (50 inches) per year, mostly falling between October and April. In most winters snowfall occurs in the mountains of Madeira. Drought conditions, coupled with hot and windy weather in summer, have caused numerous wildfires in recent years. The largest of the fires in August 2010 burned through 95 percent of the Funchal Ecological Park, a 1,000-hectare preserve set aside to restore native vegetation to the island. In July 2012 Madeira was suffering again from severe drought. Wildfires broke out on 18 July, in the midst of temperatures up to 40 °C (more than 100 °F) and high winds. By 20 July, fires had spread to the nearby island of Porto Santo, and firefighters were sent from mainland Portugal to contain the multiple blazes. In August 2016, wildfires caused over 1,000 people to be evacuated, and led to the death of three people - all of which are said to have been elderly. The wildfires threatened the capital of Madeira -Funchal - specifically, however other administrative regions of Madeira were also threatened by separate wildfires - e.g. Calheta. In the south, there is very little left of the indigenous subtropical rainforest which once covered the whole island (the original settlers set fire to the island to clear the land for farming) and gave it the name it now bears (Madeira means "wood" in Portuguese). However, in the north, the valleys contain native trees of fine growth. These "laurisilva" forests, called lauraceas madeirense, notably the forests on the northern slopes of Madeira Island, are designated as a World Heritage Site by UNESCO.The paleobotanical record of Madeira reveals that laurissilva forests has existed in this island for at least 1.8 million years. The critically endangered vine Jasminum azoricum is one of the plant species that is endemic to Madeira. The island of Madeira is wet in the northwest but dry in the southeast. In the 16th century the Portuguese started building levadas or aqueducts to carry water to the agricultural regions in the south. 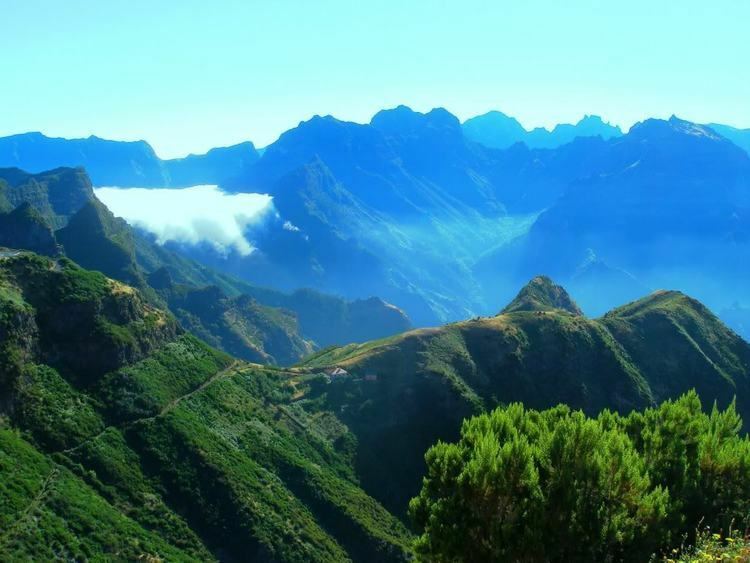 Madeira is very mountainous, and building the levadas was difficult and often sentenced criminals or slaves were used. Many are cut into the sides of mountains, and it was also necessary to dig 25 miles (40 km) of tunnels, some of which are still accessible. Today the levadas not only supply water to the southern parts of the island but provide hydro-electric power. There are over 1,350 miles (2,170 km) of levadas and they provide a network of walking paths. Some provide easy and relaxing walks through the countryside, but others are narrow, crumbling ledges where a slip could result in serious injury or death. Two of the most popular levadas to hike are the Levada do Caldeirão Verde and the Levada do Caldeirão do Inferno which should not be attempted by hikers prone to vertigo or without torches and helmets. The Levada do Caniçal is a much easier walk, running 7.1 miles (11.4 km) from Maroços to the Caniçal Tunnel. It is known as the mimosa levada because mimosa trees are found all along the route. The region has a total population of just under 270,000, the majority of whom live on the main island of Madeira where the population density is 337/km²; meanwhile only around 5,000 live on the Porto Santo Island where the population density is 112/km². There are several large Madeiran communities around the world, such as the great number in the UK, including Jersey, the Portuguese British community mostly made up of Madeirans celebrate Madeira Day. The setting-up of a free trade zone has led to the installation, under more favourable conditions, of infrastructure, production shops and essential services for small and medium-sized industrial enterprises. The Madeira Free Trade Zone, also called the Madeira International Business Centre, being a tax-privileged economic area, provides an incentive for companies, offering them financial and tax advantages via a whole range of activities exercised in the Industrial Free Zone, the Off-Shore Financial Centre, the International Shipping Register organisation, and the International Service Centre. Madeira has been a significant recipient of European Union aid, totalling up to €2 billion. In 2012, it was reported that despite a population of just 250,000, the local administration owes some €6 billion. Tourism is an important sector in the region's economy since it contributes 20% to the region's GDP, providing support throughout the year for commercial, transport and other activities and constituting a significant market for local products. The share in Gross Value Added of hotels and restaurants (9%) also highlights this phenomenon. The island of Porto Santo, with its 9 km (5.6 mi) long beach and its climate, is entirely devoted to tourism. Whale watching has become very popular in recent years. Many species of dolphins such as common dolphin, spotted dolphin, striped dolphin, bottlenose dolphin, short-finned pilot whale, and whales such as Bryde's whale, Sei whale, fin whale, sperm whale, beaked whales can be spotted near the coast or offshore. In 2009, there were 7,105 legal immigrants living in Madeira Islands. They come mostly from Brazil (1,300), the United Kingdom (912), Venezuela (732) and Ukraine (682), according to Serviço de Estrangeiros e Fronteiras (SEF). In 2013, that number dropped to 5,829, also according to SEF. The latest figures available (2015) detail another slight drop to 5,745; the majority of which are from the United Kingdom (818), Brazil (752) and Venezuela (581). Electricity on Madeira is provided solely through EEM - Empresa de Electricidade da Madeira, SA - who hold a monopoly for the provision of electrical supply on the autonomous region - and consists largely of fossil fuels, but with a significant supply of seasonal hydroelectricity from the Levada system, wind power and a small amount of solar. In 2011, renewable energy formed 26.5% of the electricity used in Madeira. Transport between the two main islands is by plane, or ferries from the Porto Santo Line, the latter also carrying vehicles. Visiting the interior of the islands is now easy thanks to construction of the Vias Rápidas, major roads built during Portugal's economic boom. Modern roads reach all points of interest on the islands. Funchal has an extensive public transportation system. Bus companies, including Horários do Funchal which has been operating for over a hundred years, have regularly scheduled routes to all points of interest on the island. Because of the geographic situation of Madeira in the Atlantic Ocean, the island has an abundance of fish of various kinds. 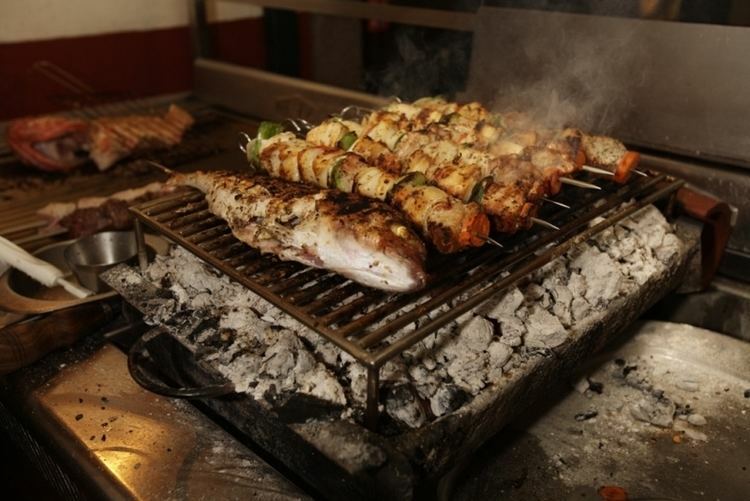 The species that are consumed the most are espada (black scabbardfish), blue fin tuna, white marlin, blue marlin, albacore, bigeye tuna, wahoo, spearfish, skipjack tuna and many others are found in the local dishes as they are found up and down the coast of Madeira. Espada is often served with banana. Bacalhau is also popular just like in Portugal. Malasadas are a Madeiran creation which were taken around the world by emigrants to places such as Hawaii. In Madeira, Malasadas are mainly consumed during the Carnival of Madeira. Pastéis de nata, as in the rest of Portugal, are also very popular. Milho frito is a very popular dish in Madeira which is very similar to the Italian dish polenta. 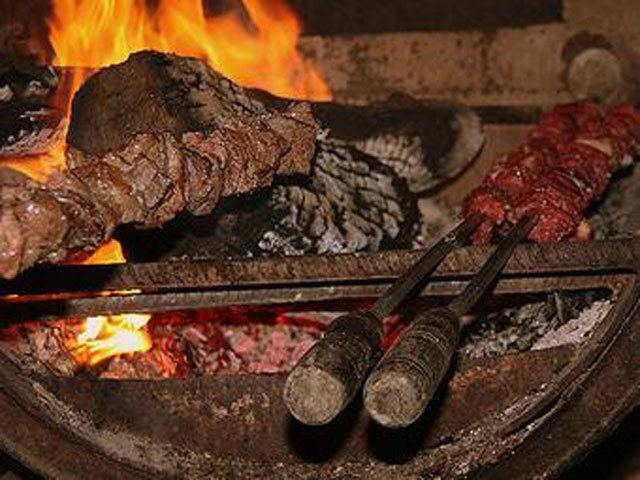 Açorda Madeirense is another popular local dish. 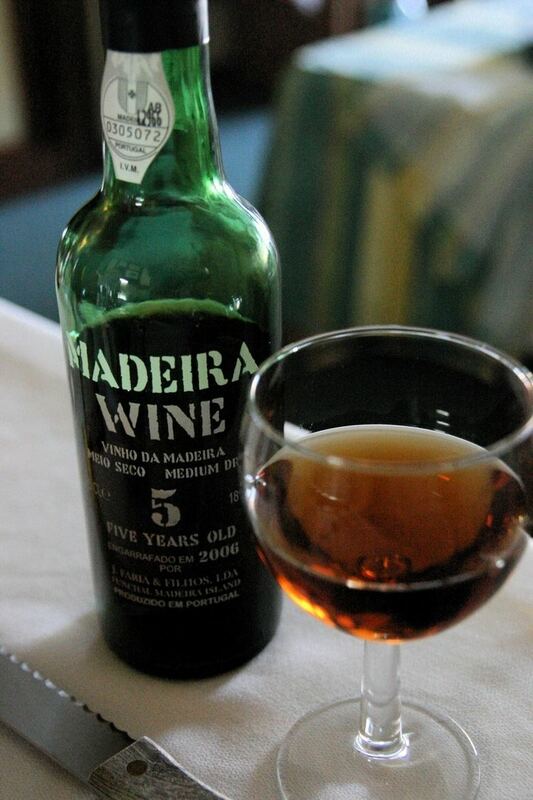 Madeira is a fortified wine, produced in the Madeira Islands; varieties may be sweet or dry. It has a history dating back to the Age of Exploration when Madeira was a standard port of call for ships heading to the New World or East Indies. To prevent the wine from spoiling, neutral grape spirits were added. However, wine producers of Madeira discovered, when an unsold shipment of wine returned to the islands after a round trip, that the flavour of the wine had been transformed by exposure to heat and movement. Today, Madeira is noted for its unique winemaking process which involves heating the wine and deliberately exposing the wine to some levels of oxidation. Most countries limit the use of the term Madeira to those wines that come from the Madeira Islands, to which the European Union grants Protected Designation of Origin (PDO) status. A local beer called Coral is produced by the Madeira Brewery, which dates from 1872. Other alcoholic drinks are also popular in Madeira, such as the locally created Poncha, Niquita, Pé de Cabra, Aniz, as well as Portuguese drinks such as Macieira Brandy, Licor Beirão.